OK so you can’t be surprised by this, really. 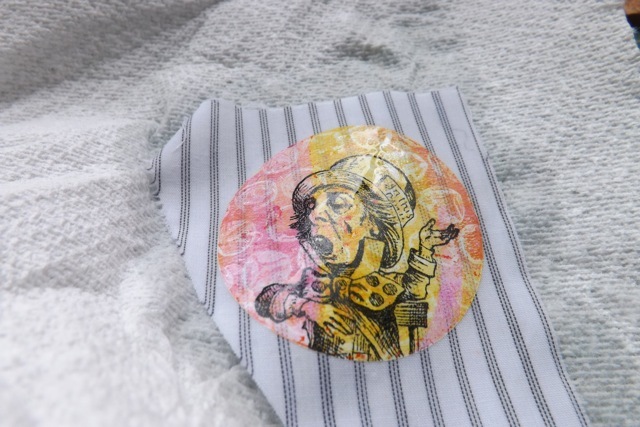 You will know from past posts that I am really loving exploring tee-shirt transfer paper and using my arty supplies with it. 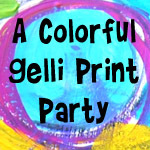 Well, since I had my Gelli plate out, it occurred to me that the transfer paper might take the prints. Had to give it a go. Two problems – first, I only have the smallest scrap of transfer paper left. And second, the only kind I have is what I think is the more unusual of the two, the stuff you decorate then peel OFF the film, lay it face UP on the fabric, then lay the silicone paper it comes on OVER it, then iron to adhere it to the fabric. I am 99% sure that the more common transfer paper, and the one I am currently out of, is the one that you lay face DOWN on the fabric and simply iron the back. The issue with that is that of course you need to reverse text, so stamping doesn’t really work for words, etc. 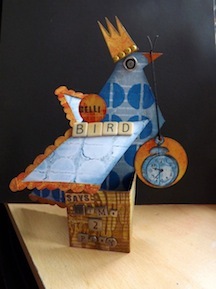 But I already know I can print over a Gelli Print, like I did on the bird, so that is not an insurmountable problem. 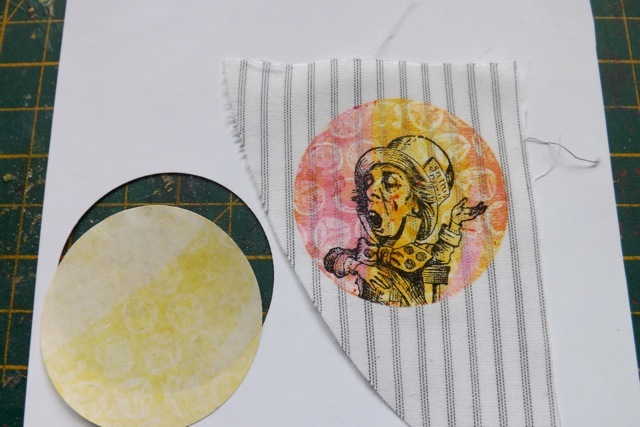 OK so I did a very small Gelli print on the transfer paper – I used the 2″ circle punch to get the shape, I have that little paper left I wanted to make sure I could try more than one if it all went wrong. It didn’t. I also used only a scrap of fabric, again because I certainly didn’t want to mess up an entire shirt if it didn’t work! I didn’t go mad with the printing, so just a couple of colours and a simple bubble-wrap press to give it some texture, then stamped the Mad Hatter on there, more because it fit the space and it was fairly detailed so I wanted to see how that worked. The usual caveats apply – you can launder it, but on a gentle cycle, do NOT put it in the dryer or iron over it. But you can see the sample has been washed (ok, not in the machine, but I was pretty vigorous in my hand washing) and there is no bleed of peeling, although I did slightly crease it when I scrunched it up in the washing. It’s dry now, and has smoothed out. I think it looks lovely and vibrant. I am heading out to get more transfer paper, probably the more common kind, to see how it works. I can see this being great on a canvas bag, for example, or like this, a small area on a larger shirt. Carolyn, of A Colourful Journey, printed with her plate right on a shirt (see it here) which cuts out the iron-on step, but I like the controlled aspect of using the transfer paper, and being able to compose my piece just how I want before I add it to the shirt (or bag or whatever) – plus the stamping and anything else I want to add. Remember, Distress Stains work as does Distress Ink, and edging with permanent marker to define it better. I have three large blank canvas bags and I think at least ONE of them needs to be experimented on, but needing the paper first…. 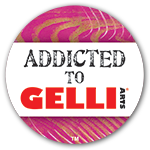 Categories: Gelli plate monoprints, stamping | Tags: Gelli plate, how-to | Permalink.